The same level of retention does not extend, necessarily, to the relationship between an affluent investor and a financial advisor. Investors frequently change their primary advisor. They have myriad reasons for doing so, but the bottom line is that an investor’s loyalty to an advisor is not iron-clad. Spectrem’s research into investor loyalty demonstrates just how rare it is for an investor to stick with an advisor from their first days as an investor to their last. It also allows investors to explain why they change advisors from time to time. In Spectrem’s new whitepaper Would They Stay or Would They Go? 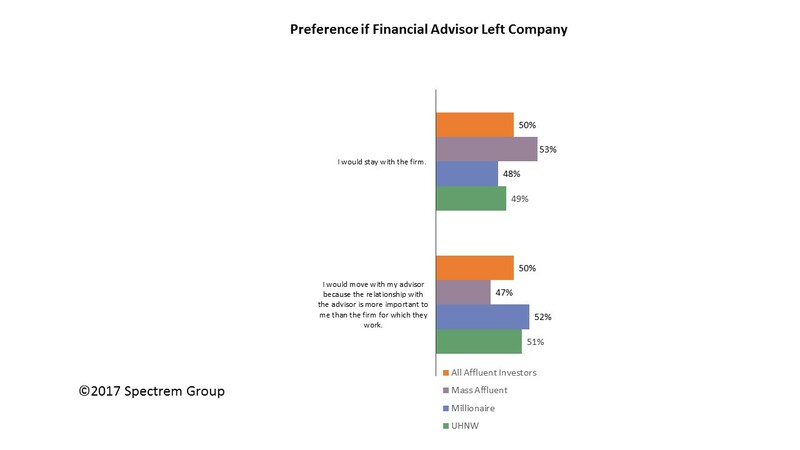 : Advisor vs. Firm Loyalty, investors were asked initially what they would do if their primary advisor left one financial provider to go work for another. Would investors stay with the advisor’s original firm or move with the advisor to the new firm? The answer to both questions, it turns out, is yes. Approximately 50 percent of investors report they would stay with the firm their advisor was originally aligned with, and 50 percent would move with the advisor to the new firm. This information is vital to advisors who can see a move in their future, or have already completed one and know that not all investors make the move with the advisor in those cases. There are distinct variations based on segments of investors regarding their intentions if their advisor moves. For instance, the older the investor is, the more likely he or she is to move with the advisor to the new firm. This is an indication that the relationship between two people has become more important than the relationship between the investor and the firm. The opposite then is true, that younger investors are much more likely to stay with the firm than move with the advisor. Making the move can be time-consuming and complicated, and older people may have more time to complete all of the paperwork that would come with a move from one firm to another. How frequently do investors change advisors? Spectrem research shows that only 23 percent of investors have been with the same advisor for more than 15 years, and almost 60 percent have been with their primary advisor for less than 10 years. These changes can come from an advisor’s retirement or because the advisor changed firms and the investor did not go with him or her. What it does indicate is that investors often pull their business from one advisor to another and that long-term investor-advisor relationships are rare. Among the reasons investors would consider changing advisors, 16 percent say they would make the change if their advisor left their current firm. It’s probably not a good idea for advisors to pit their individual services against the services of the firm and give their investor clients an ultimatum about being loyal to the advisor rather than to the provider. It comes down to maintaining and building trust throughout a relationship with an investor so that should the advisor move, that individual relationship is more important than the relationship with the firm.